As I mentioned in my previous post, the Happy Mitten team has really focused on a handful of clear goals with the games they want to publish: easy-to-learn, engaging player interaction, and allowing players to be clever. That “Magic Sauce” post focused on the player interaction, so I thought I’d write another to explain how player-cleverness comes into the game. For those who noticed my answers to the “Foxhole Fiver” at the The Meeple Mechanic website, you’ll see that I brought up the Spell Cards as an answer to a design challenge while developing the game. 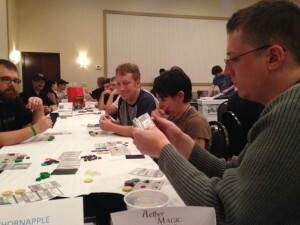 They weren’t in the game at first, but shortly after switching to the spell-casters theme, we got some incredible feedback from playtesters at one of the many cons that the Happy Mitten folks played the game at. Originally, the turn cycle ended after your Aether produced some Elements. The collection of Elements were then scored at the end of the game. But players (rightfully so) wanted something more … they wanted to be able to actually cast spells — and the spell cards were born. They use up the supply of Elements you generate and/or gain from bids, they have an immediate game effect that you carry out as soon as you cast one, and they are the points that you score throughout the game. 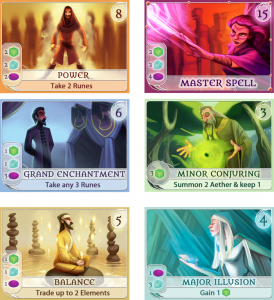 Also, one type of card — the Master Spell, which each player gets 1 of in their hand — triggers the end of the game. Primarily, the immediate game effects are where the opportunities for cleverness lie. 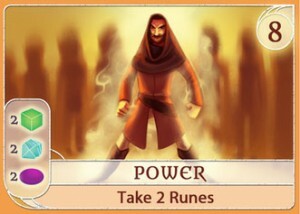 Typical effects include allowing you to swap the Runes or Elements you have with those in the central supply, to gain new Runes/Elements from the central supply, to gain new Aether, and even to move a spell that is available for all players into your hand, making it only available for you to cast. What comes from this is the ability to purposefully cast certain spells that will give you the materials you need to cast other spells — even on the current turn … making it possible to chain-cast a number of spells that you wouldn’t normally have had the materials to do. Cast that power spell shown to the right and get 2 new Runes — make sure you grab a mis-matched pair of other players’ Runes — and immediately trade the new Runes in for an Element that’ll let you cast another spell … maybe that one lets you trade a couple of your Elements with the central supply, which could give you the combo needed for a third spell. It’s fun to watch a player make that sort of swing work (especially if *you’re* that player)! Finally, the Master Spell, with its ability to trigger the final round, adds 1 more way for a player to be clever. If no one casts their Master Spell, the game will just end immediately when the Portal runs out of Aether … but, a well-timed Master Spell makes it so that each of the other players only get 1 more turn to try to cast spells. And they don’t gain any more Aether or make any bids in that final round, so they’re going to have to work with what they already have setup before that turn. It adds a nice “I’m going out!” type moment to the game and a way to challenge all of the other players to try to match what you’ve done. Put the two together — chain-cast a bunch of spells that no one was expecting *and* cast your Master Spell — and you may just grab a surprise victory that no one else saw coming. I really love that kind of thing!